This page basically discusses PeopleSoft debugging, tracing and troubleshooting techniques for various PeopleSoft technologies. Use the -TRACE option to trace the SQL executed by an application engine program. You can do this either through the command line debugger or in the override parameters of the process definition. To trace the PeopleCode executed by an application engine program use the -TOOLSTRACEPC option. These are the various tracing options and what they do. Like all other PeopleSoft trace flags these are bit fields so if you want trace values 1, 2 and 4, you would set the trace to 1 + 2 + 4 = 7 (-TRACE 7). 1 Initiates the Application Engine step trace. 2 Initiates the Application Engine SQL trace. 4 Initiates the trace for dedicated temporary table allocation to an Application Engine trace (AET) file. You can trace how the system allocates, locks, and releases temporary tables during program runs. 128 Initiates the statement timings trace to a file, which is similar to the COBOL timings trace to a file. 256 Initiates the PeopleCode detail to the file for the timings trace. 1024 Initiates the statement timings trace, but stores the results in the PS_BAT_TIMINGS_LOG and PS_BAT_TIMINGS_DTL tables. 2048 Requests a database optimizer trace file. 4096 Requests a database optimizer to be inserted in the Explain Plan table of the current database. 8192 Sets a trace for PeopleSoft Integration Broker transform programs. Note that output from the -TRACE flag goes to the application engine trace (.AET) file. Output from the -TOOLSTRACEPC output goes to the PeopleTools trace file (.TRC). To run application engine in debug mode, run the following from the command line of %PS_HOME%/bin/client/winx86. You may need to install peopletools locally first. 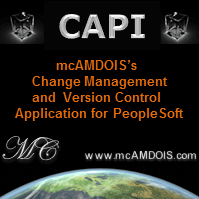 Copyright (c) 1988-2007 PeopleSoft, Inc. Application Engine Debugger - enter command or type ? for help. You can view the current values in the state record, step into code - which will take you into app designer if it is a PeopleCode step. But the best feature is that it allows you to modify the contents of a state record. This article on COBOL SQL Tracing explains how to enable tracing on a COBOL process definition. In the set trace flags on the signon page use Each Statement or through PeopleTools -> Utilities -> Debug -> Trace PeopleCode use Show Each to log all the PeopleCode that fires during your trace. This will tell you what PeopleCode and events are firing (and what is not firing) and is usually enough to give you an idea of what is going on. The best thing is that this trace produces a much smaller log file than selecting most of the other PeopleCode trace settings, making the PeopleCode trace manageable! Here's a simple example of how to log to a file. Obivously its not a good idea to use hardcoded absolute paths so adjust this code accordingly.